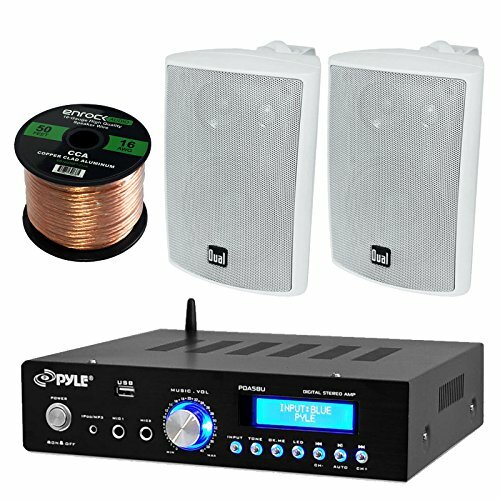 200 watt Bluetooth Stereo Amplifier Bundle Including A 50ft Speaker Wire Youll enjoy your Audio / Video Sound Like never before, Using the latest sound amplification technology, this receiver is designed to perform and deliver clear and accurate sound.detailed audio from all of your music sources. This multi-functional amp and receiver utilizes wireless Bluetooth audio transmission and works with virtually any Bluetooth-enabled device. AM/FM Stereo Receiver with Auto Scan and Frequency Display Allows You to Listen to All Your Favorite Radio Broadcasts with 60 station memory presets. LED Screen Shows AM/FM Frequency, and Mp3 Song Number and Play Time. 1/8 AUX Input with Cable and Two1/4 mic Inputs. Dual LU43PW Box Indoor/Outdoor Speakers. Excellent for Use On Home/Boats/Marine/Decks/Poolside/Outdoors/etc. Watts - RMS 50 watts, Peak 100 watts. Woofer: Polypropylene with rubber surround. Rotating logo for versatile mounting options. Two 1/4-20 insert mounts on rear of each speaker. HOME STEREO AMPLIFIER: Works with iPhone, Android, Smartphones, Tablet, MP3 player, TV, PC etc. - Remote Control Included - 2 1/4'' Mic Inputs - 200 Watts Peak Power 4 Ohm - Dimensions: 10.5 x 8.8 x 2.8 inches - Weight: 5.5 lbs. If you have any questions about this product by EnrockMarineBundle, contact us by completing and submitting the form below. If you are looking for a specif part number, please include it with your message.